I've been trying to fix this problem for two days now, but to no avail. 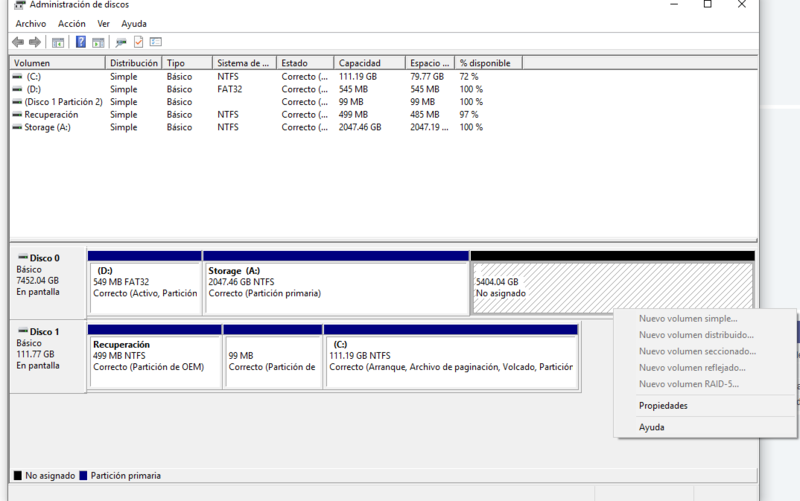 I bought a 8TB drive for my computer, and it only detected 2 upon installing Windows 10, I was recommended to buy a SSD to turn it into a hybrid which would ''make the partition usable'' however that wasn't the case, the 2 TB partition is still there, and I still can't use the remaining 6, what am I supposed to do? This is how the system looks like right now, sorry for the spanish settings. Why are the drives on those channels? I always put the OS drive on the lowest SATA channel. You have it in an odd setup. You also have a fat volume on D:. Why is that? These two oddities would have me wondering if that's why.